Click HERE to browse the original Paradox TZF web pages and listen to sound clips through the Way Back Machine. An original design...not a clone. 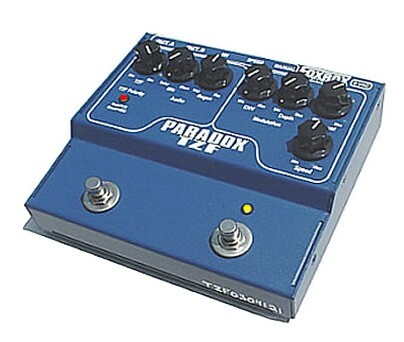 Paradox TZF is the first and only flanger of its kind. Through-zero-flanging was done in the '60s using a pair of analog tape decks. TZF recreates that over-the-top flanging sound in a stomp box. Bypass foot switch: True bypass with LED for both outputs A and B. Signal switching done with audio relays. TZF Polarity foot switch: Switches polarity of TZF signal. Dual color LED is red when positive, and green when negative.Two very different, but essential TZF sounds, with the ability to be switched during performance. Positive TZF creates a very musical sweep when it crosses over the zero point. Think - Brian May (Queen), Keep Yourself Alive. It's a very full sound with a fat low end. Negative TZF is more intense and creates a deep cancellations as it crosses over the zero point. With the right settings you can get it to become very thin and cancel out completely. Think - Hendrix, House burning down. This mode has a hollow sound, subtracting low end as it approaches the zero point. Envelope takes the dynamics of your playing and turns it into a DC voltage which is added to whatever you dialed in with the Manual control. This produces some of the most incredible flanging sounds. All Modulation controls are highly interactive and can yield flange sweeps never before created. With a distorted guitar, Env can be set to produce unpredictable, erratic flanging sounds, very similar to an airplane flying over you on a windy day. Manual (with jack for pedal control). Controls a DC voltage that sets the base delay time. Used for dialing in a custom sweep, and flanging manually. Also used in conjunction with the Depth pot, setting the base delay time, affecting upper and lower limits of the sweep. When using an expression pedal, the Manual knob can be used to set where the TZF point occurs within the pedal's travel. Speed (with jack for pedal control). When set below 11:00, it enters a much slower speed range. Min - 11:00 SLOW speed range. 11:00 - Max FAST speed range. When using a speed pedal, the Speed knob sets the fastest speed limit. TZF signal mix. Adds the TZF signal to the mix. When TZF and Modulated signal are mixed, the TZF effect occurs. MIX - Clean/Modulated delay. CCW- Modulated signal only. Can be used for vibrato effects.CW- Clean only. Center - Even mix of modulation and dry. Dial in the mix you want. TZF polarity (LED and foot switch), Red = Positive summing, Green = Negative summing. Foot switch selects between them. Regeneration positive/negative mix. Adds resonance to the mix by providing positive or negative feedback. Negative feedback is more prominent through output A, and positive feedback is more prominent through output B. This regeneration feature is calibrated NOT to self-oscillate. Distortion can occur at maximum settings when excessive signal is applied. Other: Stereo outputs (all true bypass using audio relays), 9 Volt AC operation, all-analog bucket brigade delay (BBD) based flanging, compander based noise reduction, Emphasis / de-emphasis noise reduction, easy glide action when controlling flange manually - keeps the sweep "graceful" by ramping down. Power - Paradox requires 9 Volts, AC (9VAC) in order to operate. A power adaptor is included with each unit. Don't confuse 9VAC with 9VDC, which is what you get from a 9V battery. That's what most other effects use, but not TZF. TZF's internal circuitry runs at 36Volts DC, split into plus and minus 18 Volts. Other effects that run on 9VAC include Captain Coconut 2, Digitech Whammy, Line 6 POD, and others. The power units for these effects are all interchangeable. Need an owner's manual for an original Paradox TZF? Click here to download a PDF.